To the patient readers that went through all these pages, and that forgive the mistakes that they may have found, as well as the very average humour of his author. Moreover many thanks for the comments, the recipes and the impressions that I have already received. and for its work on the "Pays de Camembert Country" web site. To fr.rec.cuisine for the recipes. To the cheese makers, their nice "norman" cows, and their delicious products. for its documentation and its work and to invite you to eat camembert cheeses with an AOC label. To me (without modesty :-) ) . A long, long time ago in Normandy, I was born in Rouen, the former capital state of that beautiful duchy. I grew up there and took advantages of that wonderful country (a bit rainy, to be honest!). Nevertheless 17 years later, I had to leave my beloved mother country to study in Lyon. After six years of hard work, I also left that town to work in a research lab in Lausanne (Switzerland) in front of the Leman Lake. There, my colleagues (Computer scientists) laughted at my habit to glorify "my" Normandy. 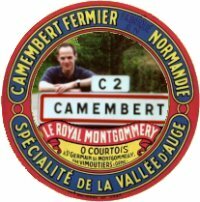 One even suggested for fun, to create a web site dedicated to the camembert cheese... Everybody laugthed (I did too) but after a short period for some unknown reason, I began to work on it! It was not the noblest cause to defend but it wasn't an uninteresting one... The site was first published in december 1996. One year later, I had to leave Switzerland, and I wanted the camembert web site to go on (Vanity :-) ). For that reason these pages are hosted since december 1997on Pays de Camembert - Camembert Country site. At the end of that beautiful history, the author would like to thank all the web-surfers that have appreciated his work and that send him lots of nice comments or new recipes and for the ones that didn't send critics! The enthousiam is still there and I hope I will be able to go on improving this site (That's rather easy! :-) ). May the Camembert be with you!